It’s already been a pretty wild off season in the NHL with lots of big names changing teams. As we are in the dog days of summer, we might as well get prepped for the 2016-17 season and discuss the fantasy impacts of all these moves. I introduce to you Offseason Fantasy Quick Hits. I will be discussing the fantasy impact of all major moves made by all NHL teams over the course of the summer. Part eighteen of the series previews the Arizona Coyotes for this upcoming season. Not much to really discuss on the Coyotes. Along with the Leafs and the Jets, they have one of the best and most up and coming system of young players, but outside of Domi and Duclair, none are really ready to step in this year and make a fantasy impact. 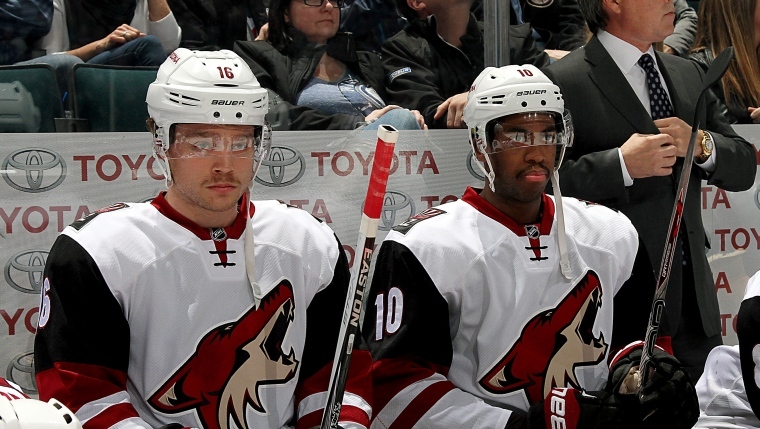 I think Domi is the more talented player of him and Duclair now and in the future. I think if he can avoid the dreaded sopohomore slump, he will slightly improve upon last year’s numbers. He could put up 25 goals and 60 points, but I wouldn’t bet the house on it. For now I will conservatively estimate him at 20 goals and 55 points. He will certainly get lots of playing time and opportunity this year. Duclair potted 20 last year and should be able to do that again. I wouldn’t bank on him scoring more than 55 points though either. Domi and Duclair are still only 21 years old and are both being heavily relied on to lead a below-average Yote’s offense. That’s a lot of pressure to put on two 21 year old’s as they are also expected to improve in other aspects of their game, namely their two way play. I think he scores 20 goals again, maybe even 25. While he certainly can score 30 goals, I’m not that confident he will this year. Both him and Domi are good picks in the mid-later rounds of your draft. Guys like Radim Vrbata and Shane Doan’s once were fantasy darlings but they are up there in age. If you are in a really deep league and one of them ends up playing right wing to Domi and Duclair, I don’t mind either as a late pick. I’d probably stay away though and lean towards higher upside guys. Tobias Rieder has 50 point upside this year but I don’t think much more and probably wouldn’t draft him. Either way he’s currently sitting out training camp as he doesn’t have a contract for this upcoming season. For now I’d definitely stay away until we see how this situation plays out. Oliver Ekman-Larsson, better known as OEL, is entering his 6th professional season in the NHL and is only 25 years old still. He has put up 2 consecutive 20 goal seasons as a defenseman, and has improved statistically each year in the league. Now is the time to draft him amongst the other elite defenseman such as Karlsson, Burns, Letang and Subban. I think because he’s on a non-traditional hockey market team like Arizona he doesn’t get the same exposure as the above mentioned guys. But if you watch him play, you know that this guy is a special talent. His ADP is probably a shade below all of those other d-man, which it should be, but if any other defenseman in the league has a chance to put up 60 points, I’d bet on it being OEL. I like him where I think you can draft him and think he can pay off HUGE dividends for your team this year. He is the one must-own player across all leagues in fantasy for Arizona. Michael Stone can put up 40 points if he manages to stick on the point of the Yotes #1 PP unit. He’s draftable as a late round defenseman. I’d take a wait and see approach with Dylan Strome. I don’t think he will come into the league and set fire right away. I think it will take him some time. You could take him as a last round lottery ticket type guy, but I’ll probably have him on the watch list to start the year. He’s a top prospect in keeper leagues though. I think there are much better goaltending options out there than Mike Smith and Louis Dominigue. Smith is the vet and should still get more starts. I personally wouldn’t draft him, but either of the two could feasibly be an average to below average 2nd goalie for your team. Prospect Anthony DeAngelo has really high offensive upside but some attitude problems, which is why Tampa Bay gave up on him. He’s still an intriguing keeper league prospect, but I don’t think he makes an impact this year. The Coyotes have many other top prospects, like Jakob Chychrun, Clayton Keller, Lawson Crouse, Brendan Perlini, Ryan McInnis, Nick Merkley, Christian Fischer, Conor Garland and more. They are viable keeper league guys, but not relevant in one year leagues.